Lizzie Douglas, a.k.a. Memphis Minnie, was born in 1897 in Algiers, Louisiana. The eldest of 13 children, she learned to play the guitar at the age of 11 and was performing on the streets of Memphis, Tennessee, by the time she was 13. From 1916 to 1920, she toured with the Ringling Brothers Circus, and then wound up back on Beale Street in Memphis. Memphis Minnie had a breakthrough in 1929 while performing with her then-husband, Joe McCoy, at a Memphis barber shop. A Columbia records talent scout heard the duo and invited them to New York to record. The pair, billed as Kansas Joe and Memphis Minnie, recorded and performed together from 1930 until 1935. By 1957, interest in her music had begun to wane, and Memphis Minnie, at age 60, retired from music. Three years later she suffered a stroke, which confined her to a wheelchair; her health continued to decline, and she passed away in 1973 at the Jell Nursing home in Memphis. Memphis Minnie’s guitar playing has gone mostly underappreciated through the decades, but for many blues-inspired fingerpickers she is a crucial link in the chain of Delta blues through to Chicago blues. Examples 1–4 are inspired by “Crazy Cryin’ Blues.” The guitar parts here reflect the anguish and urgency of the vocals. If you play along with the original recordings, use a capo at the sixth fret. 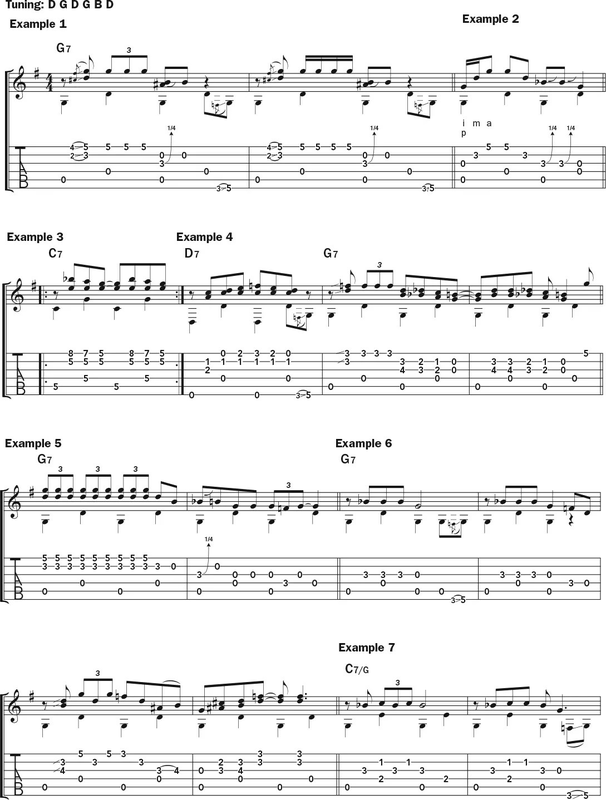 In Example 1, over the I chord (G7) intro, Memphis Minnie plays a stock open-G line, but in the second bar she turns the triplet line into 16th notes, which increases the urgency. Note that on the recording there is a second guitar (played by Joe McCoy) in the mix, so it can be a little hard to distinguish the bass pattern, but an alternating bass line on strings 5 and 4 sounds appropriate enough. 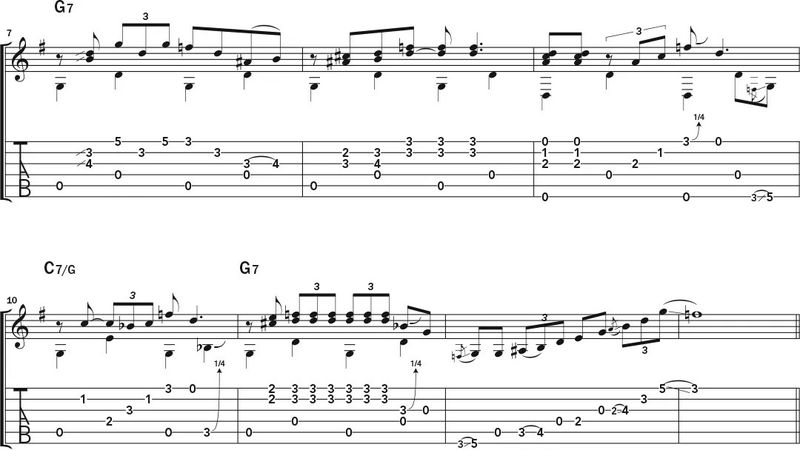 In later verses of “Crazy,” Memphis Minnie throws in some nice finger rolls similar to those shown in Example 2. The typical blues guitarist picks with the thumb and one or two fingers, but to execute the roll it’s best to use your thumb (p), index (i), middle (m), and ring (a) fingers as shown in the notation. When playing this kind of roll, your picking hand should move as if you’re turning a doorknob. Example 3 demonstrates a typical move to the IV chord, with strings 1–5 barred at fret 5, and a descending line on string 1. Bar the fifth fret with your first finger and use your fourth and third fingers to stop the eighth- and seventh-fret notes, respectively. Example 4 approximates the last three measures of “Crazy”’s 12-bar verse. 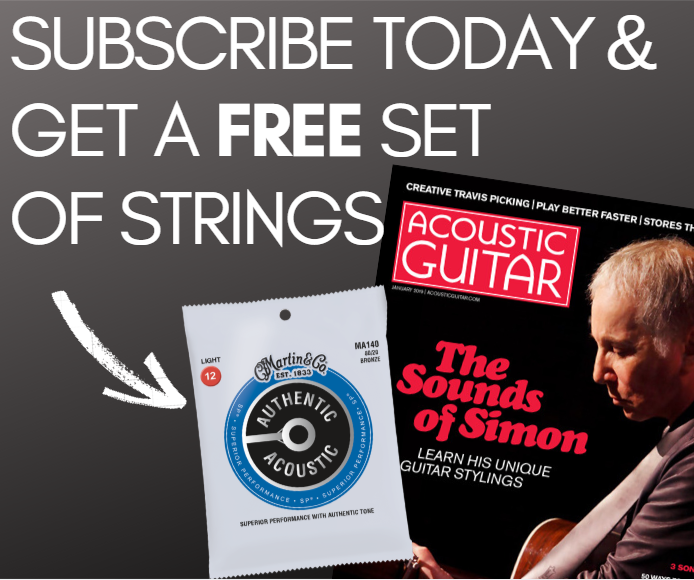 Start out with a D7 chord, fingered the same way as in standard tuning, but with a slight change—the first string is open, rather than stopped at the second fret. Note how the notes on string 1 then ascend and descend through notes that include the ninth (E) and raised ninth (F/E#), adding a bit of sophistication to the proceedings. After the D7 bar, you’ll play a very cool G-chord run: Slide with your first finger, barring the top two strings, to imply a G7 chord that morphs its way into a G triad played on strings 2 and 3, fretted with the first and second fingers, respectively. Maintain that shape as you descend chromatically down to another G played on the open G and B strings. Examples 5–8 are based on “Don’t Want No Woman,” a duet with Kansas Joe. To match the pitch of the original recording, use a capo at the second fret. The opening line of the intro is shown in Example 5, which throws out a barrage of attention-grabbing double-stop triplets before settling into a more languid pattern in bar 2. This sets up the background for the first two bars of the verses, depicted in Example 6. The second two bars of Ex. 6 open up the guitar part as a response to the first two-bar vocal line. You might notice some similarity between these two bars and the G phrase in Ex. 4. When you study a player’s style you will come to see these patterns and understand how his or her fingers travel the fretboard. Make note of these sections and you will gain valuable insights. Example 7 shows how Memphis Minnie would play the IV chord in “Don’t Want No Woman.” In this voicing, she leaves the fifth string open, playing a G in the bass. She will use a similar approach for “Wild About My Stuff,” which you’ll look at in a moment. The last four bars of a “Don’t Want” verse are depicted in Example 8. Start with the same D7 chord you used in Ex. 4 and play another quick roll on beat 3 using p-i-m-a picking technique; grab the third-fret F on string 1 with your fourth finger. 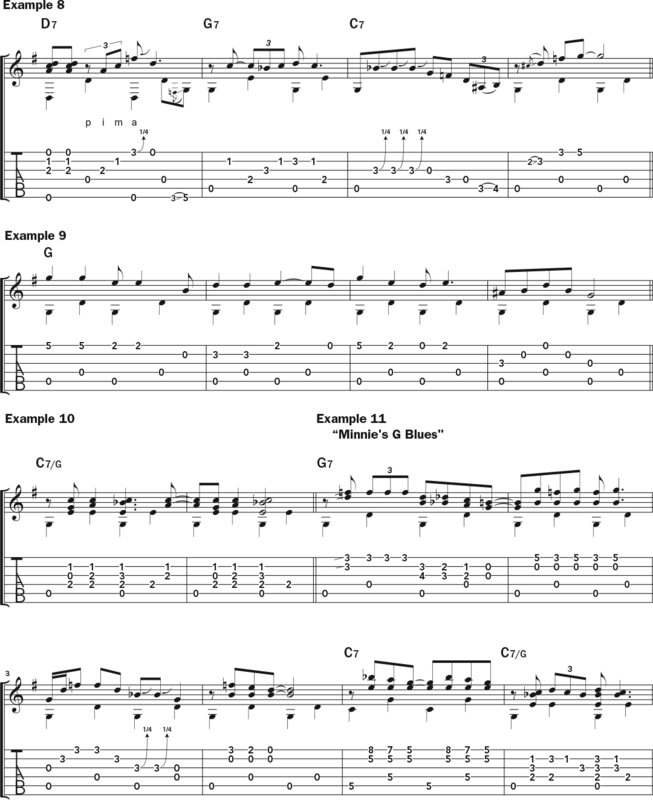 Play the same C7 chord with G in the bass from the previous example and finish off with a two-measure phrase on G.
Examples 9–10 are based on the hokum-style ditty “Wild About My Stuff.” This playful song, with its double-entendre lyrics, has a fun guitar accompaniment that should put a smile on your face. Capo at the first fret to match the original recording. In Example 9, the first four bars of the verse house a melodic phrase played between frets 2 and 5. I suggest dedicating one finger to each fret—first finger on fret 2, second on fret 3, etc. This will help you navigate the phrase without too much difficulty. Example 11 is a little piece I call “Minnie’s G Blues.” In the first bar I borrow a phrase from “Crazy Cryin’ Blues,” and create a response in the second bar borrowed from Robert Johnson’s “Terraplane Blues.” In the third measure I take the roll from “Crazy” and answer it with a simple descending run down the first string. For the IV chord in measure 5, play the barre chord from Ex. 3 and then switch to the C7/G chord from Ex. 7, adding a third-fret D with your fourth finger on beat 2. Measures 7–9 are taken directly from “Don’t Want No Woman,” but in measure 10, to approach the IV chord from the V, I keep the F note as an echo of the previous chord. In the final two measures, return to G with a triplet-based double-stop and a single-string run that ascends from string 6 and culminates in a slide from G to the flatted seventh, F.
Memphis Minnie’s guitar playing has gone mostly underappreciated through the decades, but for many blues-inspired fingerpickers she is a crucial link in the chain of Delta blues through to Chicago blues. Now that you have some of her ideas under your fingers, go out there and show some of your stuff.